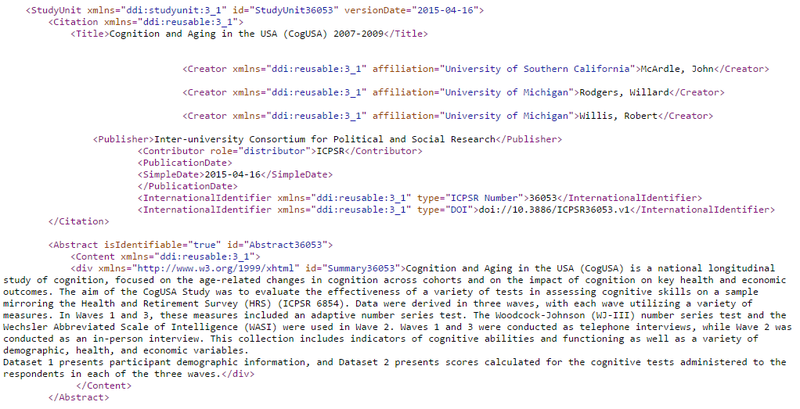 To create an online data catalog of study-level metadata records, you will need to “mark up” or tag those records using DDI. If you have existing records in some other form like Dublin Core or MARC, you can use the existing fields in those records as a foundation for the new DDI records. To do that, you need to map the fields to DDI. A mapping from Dublin Core to DDI is available for this purpose. Since Dublin Core is very limited, you will most likely want to add additional DDI fields to the records you are creating. 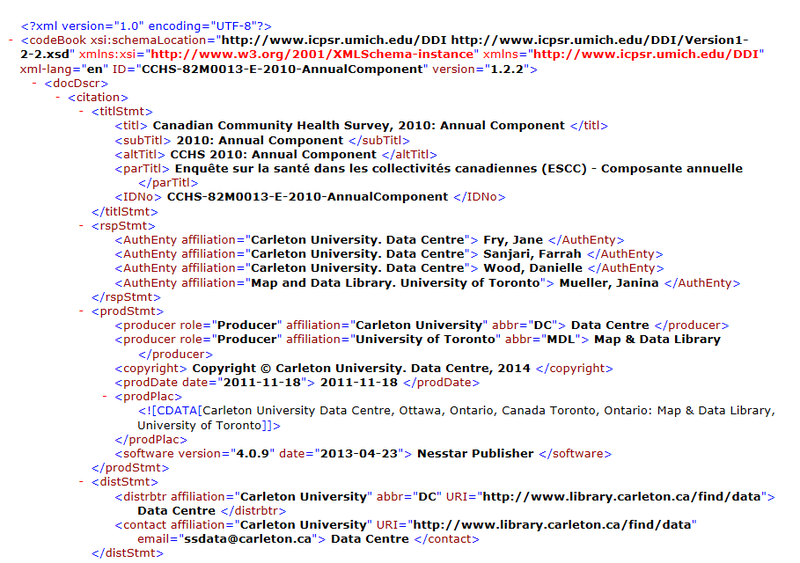 Study-level metadata available in data catalogs usually describe the program or project from which the data come (i.e., context). This includes key elements about a study, including purpose, the data collection process, and information describing aspects of the research design, such as the universe and sample being surveyed, time period, geographic location, etc. It can be helpful to examine which fields others are using. DDI Lite provides a set of basic DDI fields for discovery. 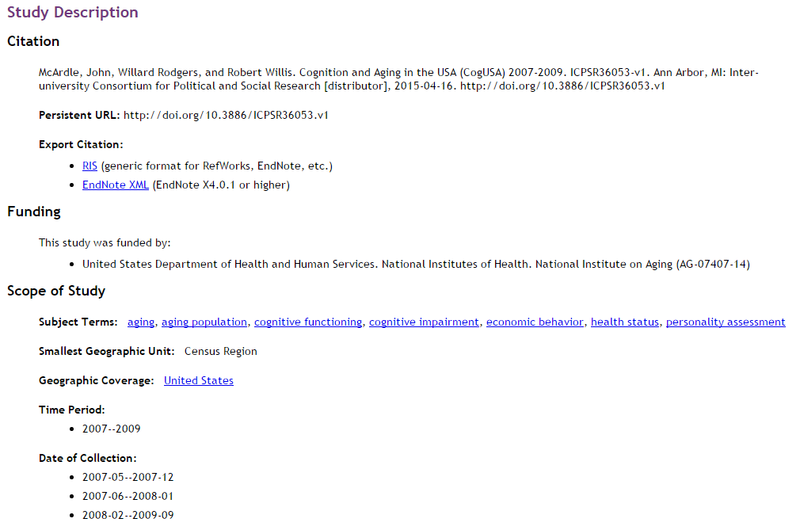 You may also want to consult the CESSDA, <odesi>, IHSN, Dataverse, and ICPSR catalogs. 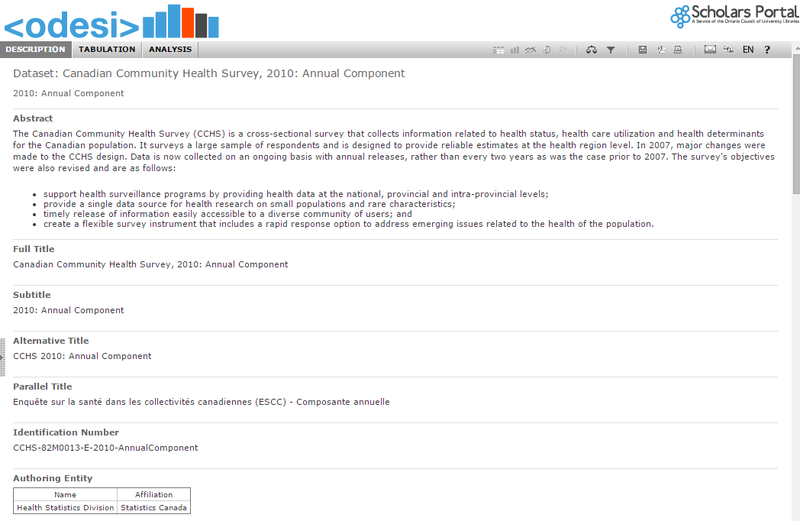 ICPSR provides its records in DDI Codebook (Version 2.1 and 2.5) and DDI Lifecycle (Version 3.1) XML format, available on each individual study homepage or in bulk for the full collection of records. There are several good tools to create DDI metadata for use in a data catalog(s), including Nesstar Publisher (used by CESSDA and <odesi> catalogs shown above) and NADA (used by the IHSN catalogs). These tools are efficient because they enable the creation of data catalogs with limited effort. And there are excellent training tools (both guides and videos) available to help get you started.